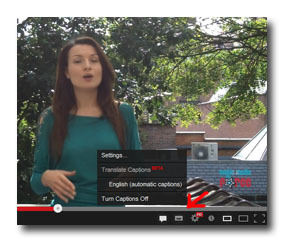 Adding subtitles to your YouTube videos is a fabulous idea and can be done quite easily. When you’re in the production and editing phase of your web videos, do you ever think: How will individuals who can’t hear well understand my video? More than likely, you have not thought about adding any type of hearing assistance aid to your web video. To say they are not perfect is a massive understatement. I don’t see how these subtitles could help anybody who has problems hearing or doesn’t have audio options, because honestly, it’s a total mess. This is quite a tragedy because there are currently over 20 million individuals who are hard of hearing. And because of this, they may watch your video and not understand what you are saying or doing, because they can’t hear you. Many people do not add captions to their web video because it takes a lot of work. It can be a long process to add captions or subtitles, however, if you are able to do it there are also major benefits. The main benefit is gaining a whole new following, which are the individuals who are hard of hearing and people working in open offices who are not allowed speakers. There are plenty of professional subtitling companies who can transcribe, translate and subtitle your video. However, this costs a massive amount of money. How To Add Subtitles To Your YouTube Videos Yourself? There is some great online (free) software that you can use to add subtitles to your YouTube videos. CaptionTube has to be my favorite one, you can log in with your Google/YouTube account, pick an already uploaded YouTube video and add the subtitles one by one. Quite easy but certainly time consuming. YouTube Subtitler works quite similar, with the difference that you can add your complete transcription at once, and correct the timing afterwords. For a little more advanced subtitling, you can use one of the following downloadable free subtitle programs: Subtitle Workshop or Movie Captioner. Professional subtitle companies you can find easily with a Google search. Please let me know if you find this post helpful with one of your witty comments. As usual, you are way ahead of the crowd and coming up with some amazing stuff. I totally agree with you Henk! You are excellent my girl! Do we like you? No! We LOVE you! You are great. Your article is very useful, thank you a lot. Thank you Oleg for your feedback! Again and again you keep surprising us with new features! It’s always exciting to me when I come across a real pro I didn’t already know about. I will definitely be linking to your site from my ‘tools and valuable resources’ page for all my site visitors to check out. You have a TON of great content – thanks for sharing!